Shad Museum: Located at 212 Saybrook Road (Route 154) this small museum is located in the former Maynard's Shad Shack. Shad, the Connecticut State Fish, has been harvested in town since it's founding in 1662 and from 1760 through the 19th century was a successful commercial enterprise. Shad fishing in Haddam was said to "be an industry of much profit and importance." In 1814 there were at least 17 locations in town where shad were caught and that year saw a catch of 200, 000. Over most of the history or shad fishing, it was done by 'haul seining' during the daytime but this practice stopped in the 1950's when the fish became less numerous and the river travel increased. Shad fishing now is done by law at night with 'drift nets.' Boning shad was and is today considered an art form. Call museum director, Dr. Joseph Zaientz at 860-267-0388 for additional information. Veteran's Museum: This site dedicated to the men and women who served our country in the Armed Forces is located in the old Firehouse station on the southern side of the Higganum Green on Candlewood Hill Road. Higganum Feed Store: This wonderfully preserved commercial establishment was erected around 1880 during the heyday of Higganum's industrial activity and has for over 120 years provided local citizens with agricultural goods. Buckley E. Johnson was responsible for constructing the Feed Store and it remained in the family until 1924. The feed store is located just to the south of the Country Market (formerly the Higganum Grange). Higganum Grange: It is said that the Bank Building Company erected this commercial structure with decorative parapet (or false front) in 1882 which originally housed Emmett Spencer's grocery store, the post office and bank. The upstairs was used to show movies with a piano accompanist and also used as a basketball court. For some time the building was known as Brainard Hall. The Haddam Grange was organized in 1891 and had rented space above Olsen's Store for 45 years (located directly to the north of the existing grange and no longer standing). In 1896 the Grange changed its name to Higganum Grange and in 1936 purchased it as their headquarters. Today the Higganum Country Market occupies the ground floor. Brainerd Memorial Library: One of Haddam's finest structures, the Brainerd Memorial Library is located along the east side of Saybrook Road on land donated by Judge Ephraim P. Arnold. The Library was built between 1906-1908 with a generous donation from Cyprian Strong Brainerd, a New York City lawyer and Haddam Neck native. The Boston architectural firm of McLean and Wright designed the original Beaux-Arts style brick building. The fa�ade features central entrance pavilion with a pedimented gable supported by Doric columns and pilaster. The interior lobby features an ornate dome with the Brainerd coat of arms and figures symbolic of Commerce, Justice, Art, and Music. In 1996 a large addition was erected to the rear and features matching brick and architectural details. The founders of the library "set out to establish and maintain a public library and reading room and rooms for the purpose of science and art." The Haddam Library Association, which was founded in 1896 donated many of the original books. 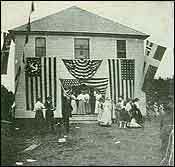 The town had several previous "Library Associations" dating back to the late 1700's including the Wide Awake Society and Haddam Anti-Slavery Society. Today the library is operated by a Board of Directors and has an active Friends of the Library association. Mill Creek - Connecticut Valley Railroad Bridge: Mill Creek received its name from a grist mill built along the stream in 1706. The railroad bridge, which dates from about 1870, allowed the Connecticut Valley Railroad to traverse the creek. Haddam had 5 railroad stations Higganum, Walkley, Haddam, Arnolds, Goodspeed (Tylerville). The bridge's big claim to fame is that it appeared in the 1958 Doris Day movie It Happened to Jane. Spencer's Shad Shack: A local landmark since 1930, Spencer's Shad Shack located along the east side of Route 154 south of the UCONN Extension Center, is open on a seasonal basis when the shad are running. Shad have played an important role in the community's history and Spencer's is Connecticut's only remaining Shad Shack. Camp Bethel: Located on the east side of Camp Bethel Road, the Camp Bethel Campground sits on a campus of 55 acres extending to a bluff overlooking the Connecticut River. In 1878 the property was leased to Jared S. Clark for "camp meeting purposes, July-September" In 1887 the Life and Advent Campmeeting Association was established and purchased the land for a permanent campground. Early campmeetings were held the first two weeks of August and attended by people from all over the country. Tents were placed around a central chapel. Over time the tents were replaced with cottages and the camp became a full summer retreat. In 1965 the organization became nondenominational and was renamed the Camp Bethel Association. Early tents were white and embellished with red braid trim. These were replaced with Victorian style cottages similar to those found on Martha's Vineyard and could feature board and batten siding, bargeboarding and decorative trim. Most cottages were built between 1890-1920, although later ones continue to feature decorative details. The Boyd Memorial Chapel in the center of the grounds is three stories with a two tiered porch and ornate trim. In the 1870’s Otto Carlson started making commercial root beer and birch beer in Swede Hill (upper part of Christian Hill Road) in Higganum. Carlson had a nostalgic longing for a drink remembered from his boyhood in Sweden, ‘bjord drick’ made from sap tapped from Sweden’s prolific birch trees. Not having enough birch trees around Higganum for commercial scale tapping, Otto developed a formula using cut up birch trees and steaming out their oils and juices. This became the commonly used commercial method of producing the popular birch beer. Otto’s root recipe for root beer: Sassafras, sweet fern and princess pine roots were steeped in a cauldron of water over a wood fire to which sugar and yeast were later added. After cooling the liquid was stored in cedar vats to a critical point and finally bottled by hand. Needing a large quantity of water for his company, Carlson discovered a large bubbling spring in a cleft of granite rocks on the western slope of Ladder Pole Mountain in Higganum. This was “pure spring water”, above and beyond any possible contamination. Granite Rock Springs was 450 feet above sea level, up hill from Otto’s shop and overlooking the present Route 81. Otto Carlson named his beverage company UNDINA, meaning the Goddess of Water. The business also used the name Granite Rock Spring for its spring water. A write up on the spring notes that the “no part of its watershed is exposed to the seepage of cultivated fields or the impurities of inhabited areas. Its home is in the wild heart of nature and it gushes forth, a living, crystal clear stream of pure, soft water, a stream so large as to form the source of a mountain brook that is never dry but continually leaps and dances down the mountain-side until its waters finally join those of the Connecticut. The spring was formerly known by the names of ‘Indian Spring’, ‘Cold Spring’ and ‘Warm Spring’ and was said to be warm in the winter and cold in the summer. It is believed to remain at a constant 48 degrees year round”. IN the early 1900’s Undina was a popular brand of soda pop, with white birch beer its most popular flavor. Undina was distributed throughout Middlesex County and other parts of Connecticut and upstate New York. In 1935 the Undina building was damaged by fire and rebuilt. In 1945 Undina Beverage Company was purchased by Carl Anderson of Higganum and Eric Johnson, both of whom also remembered the cool refreshing ‘bjord drick’ in Sweden and took pride in maintaining production of the white clear drink. By the 1950’s Undina Bottling Works was thriving and producing 500 cases of soda per day. It remained at the same site as Carlson’s original shop, although the extraction was no longer done there. In 1960 the company was purchased by Middletown residents Trean Neag and Fred Norton. Undina Beverages in 16 flavors, were sold in stores as well as provided county wide to restaurants, bars and hot dog stands. By 1980 the old spring was no longer used; there was not enough water capacity for the soda operation.